IQS Directory provides an extensive list of industrial roller manufacturers and suppliers. Utilize our website to review and source industrial roller manufactures with our easy-to-use features which allow you to locate industrial roller companies that will design, engineer, and manufacture industrial rollers for your exact specifications. Our request for quote forms make it easy to connect with leading industrial roller manufacturers. View company profiles, website links, locations, phone number, product videos, customer reviews, product specific news articles and other production information. We are a leading manufacturer directory who will connect you with the right manufacturers whether you are looking for industrial roller tables, 50 inch industrial rollers, or industrial rubber rollers. Our goal is to provide personal service to all our customers. We answer each call ourselves, with only qualified engineers and staff members answering your questions. We know how important speaking to a knowledgeable person is, which is why we work our hardest to make your customer experience enjoyable. Find out how you can benefit from our services or industrial rollers by contacting us today! With over 40 years of industry experience, we are the rubber king. We take pride in the quality that we offer to our customer, and we will work to satisfy the needs of each customer as well as aim to exceed your expectations every day. We carry a variety of rubber roller products, including industrial rollers for use in industries around the world. If you are looking for quality industrial rollers, you’ve come to the right place! We offer the best products for our customers in a variety of industries. We supply customers around the world with high quality, affordable rollers that can be used anywhere. We use our years of experience to continue to supply our customers with the best possible products. Contact us today to find out more! 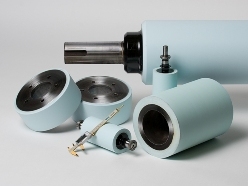 For nearly 70 years, REDCO has been a one-stop source for precision rubber rollers. We offer a complete in-house shop for the fabrication of custom rubber and elastomer products. We take pride in quality, precision, and on-time delivery. For a complete list of our capabilities, visit our website. If you are looking for quality industrial rollers, you’ve come to the right place! We have nearly 30 years of experience creating rollers for the industrial market, and ever since 1984, we have done our best to use our talents and experience to benefit all customers. Our goal is to turn each customer into a lifelong relationship that benefits both of us. Let us show you how we can help you by contacting us today! When it comes to industrial rollers, experience and knowledge is key. We have over 50 years of experience at our company, and we use all of our knowledge combined with family values like integrity, honesty, and quality. We treat all customers like family, because we are family owned and operated. Contact us today or visit our website to find out more! Industrial rollers are cylindrical rolls that either have an elastomer bonded to a metal core or are formed as solid rubber. As basic and integral components of numerous industrial manufacturing and processing applications, industrial rollers can suit many purposes. While industrial rollers are used primarily to facilitate movement to various machine parts, they can also be used to provide support and transportation to materials moving through the machine. Some examples of different types of industrial machinery in which industrial rollers are utilized include various types of conveyor systems, web converters, printing presses, stamping presses, feeding machines, bending machines and many more. Due to the wide variety of machinery in which they are used, industrial rollers can be used in an expanse of applications including coating, drying, annealing, calendaring, embossing, metal processing, heat treating, packaging and bulk material handling. 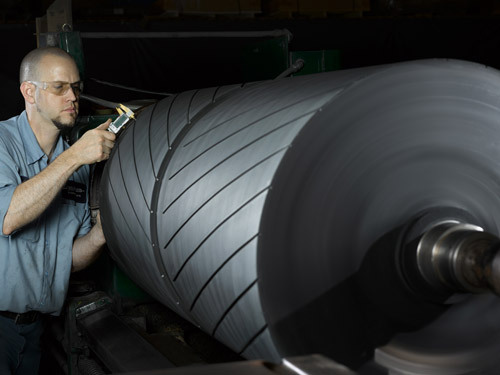 Able to be fabricated from a broad spectrum of elastomeric materials, industrial rollers can be made from varied synthetic rubbers such a neoprene, nitrile, EPDM and polyurethane. When formed with a metal core, industrial rollers typically have core materials of aluminum, steel and stainless steel. Various types of industrial rollers include drive rollers, guide rollers and conveyor rollers, of which conveyor rollers are likely the most common. Industrial rollers can be manufactured through either molding or casting processes and even, in some cases, extrusion processes. However, the molding processes of injection and compression molding are most commonly used for solid rubber industrial rollers. In injection molding, rubber is heated and then injected into the cavity of a closed split die chamber or mold, which is then cooled to form the roller. In compression molding, the rubber is heated and then placed in a heated mold under extreme pressure in order to achieve the roller shape. In the extrusion process, industrial rollers are formed by heating rubber and then squeezing the molten rubber through a die that has a pin attached to the center, which is used to form the hollow inside of the roller. For industrial rollers that have a metal core, the core is generally formed through a metal machining process such as metal stamping. Metal stamping is similar to the extrusion process, with the same type of die with a pin, which shapes metal cores from the inserted metal material. The top part of the die connects to the press slide, while the bottom part connects to the press bed. The punch, also known as a ram, then applies pressure, which forces the metal to be squeezed through the die and thus form the roller. A rubber to metal bonding process is then used to form a rubber jacket over the metal core. In this process rubber is adhered to a metal substrate through the use of a bonding agent. Industrial Rollers - Harwood Rubber Products, Inc.